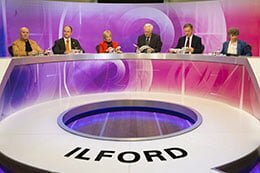 Did you catch BBC Question Time in Redbridge Town Hall on April 7th? More than 150 Redbridge residents joined the audience. Three Redbridge residents asked questions: about the EU referendum, tax avoidance and the possible nationalisation of the Port Talbot steel plant. Many more took part in discussions about each issue. Redbridge Council’s Film Office is managed by FilmFixer. FilmFixer director Andrew Pavord said, “We were delighted to make Redbridge Town Hall in Ilford available to the production. “The ability to accommodate a large unit such as this is a milestone in the Redbridge film office service. “Sixty crew and cast were welcomed, converting the Town Hall into a broadcast studio, audience room, green room and production office. The panellists joining host David Dimbleby were: Former This Morning presenter Anna Soubry MP, who is minister for small business, industry and enterprise; Labour’s shadow leader of the house Chris Bryant; and Ukip MP Douglas Carswell; along with author of Trainspotting and Filth Irvine Welsh; and economist Ruth Lea. Take a look at the broadcast here.